My breakfast each morning is often the same. I'll start my day with a bowl of oatmeal or yogurt and a sprinkling of berries. Sometimes I'll throw in some chunky unsweetened applesauce. In the spring when fresh rhubarb is available, a wonderful substitute for the applesauce is a rhubarb compote. It's fresh tangy taste and beautiful color is a nice addition to any yogurt bowl. It can be made ahead of time and kept chilled in the refrigerator to have on hand whenever you need it.Throw in a handful of granola, a sprinkling of chopped nuts, berries, and flax seeds, and you've got a mighty fine breakfast. It's a perfect way to kick start your day! 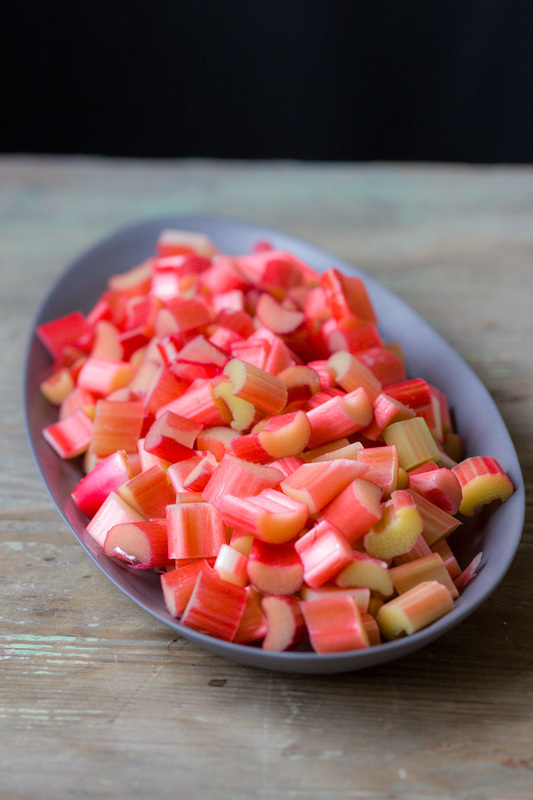 Cook rhubarb with water and honey in a covered saucepan over medium low heat for 15 minutes until softened. Uncover and continue cooking over low heat, stirring occasionally until slightly thickened, about 10 minutes. Set aside to cool slightly. Taste for sweetness and adjust if too tart for your taste. Place in blender or food processor for a minute. Refrigerate for at least one hour or until ready to use. Compote will thicken and darken in color as it sits. Add yogurt to one side of bowl, rhubarb to the other side. Sprinkle remaining ingredients over the top and serve.